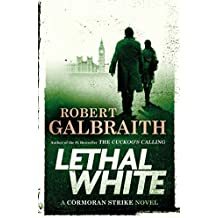 Publisher’s Weekly Starred Review of Lethal White by Robert Galbraith – Joyce's mystery and fiction book reviews with some non-fiction too! Well, sorry to say this fourth book in the series didn’t live up to my expectations; it needed serious editing and rambled on too long with too many storylines; it was bogged down with dialogue thus lacking tension; and although the characters were well portrayed, their emotional angst got a bit tedious creating a drama rather than a crime novel. Did you enjoy reading it? I have not as yet read it but you are not the first to say what you did. I will still read the book but am less excited than I was. By the way, have you seen the CB Strike TV series? I don’t think of it as sour grapes! It is your opinion and I value that.